The Santa Barbara Museum of Art presents a monographic show of the Romantic French master, centering on a recently attributed painting. To discover an unknown work by a great artist, or to establish an attribution that enlarges an artist’s body of work, is every curator’s dream. It recently came true, and spectacularly so, for Eik Kahng, chief curator of the Santa Barbara Museum of Art in California. In 2009, she was approached by a local collector who had an unsigned painting that strongly resembled a famous composition by Eugène Delacroix. 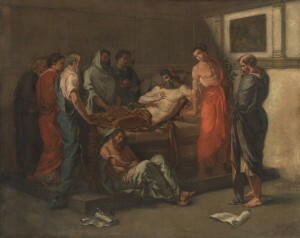 Its subject was one that Delacroix painted several times—the death scene of Marcus Aurelius, in which the philosophic Roman emperor rises from his sickbed to instruct his entourage on how to guide his dissipated son and heir Commodus. 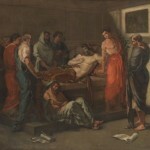 The prime version, a monumental oil on canvas from 1844, is in the Museé des Beaux-Arts in Lyon, France, and several other iterations by the artist are known to exist. But this one, a small easel painting in oils, had never been seen in public before and had never been mentioned in the literature. Now Kahng is decisively attributing it to Delacroix and publishing it for the first time, in the catalogue for an exhibition that the Santa Barbara Museum of Art has organized around it. Through January 26, the museum will host “Delacroix and the Matter of Finish,” placing The Last Words of Marcus Aurelius in context by showing it alongside 30 other paintings and 18 works on paper—mostly by Delacroix—loaned from institutions around the world. The exhibition will travel to the Birmingham Museum of Art, where it will be on view from February 22 through May 18. At first, when Kahng saw the canvas at the owner’s house, she assumed it was a preparatory sketch for the Lyon painting. “But as I studied the painting at length,” she recalls, “it became clear that this was not a study so much as a variation that subtly reinterprets the psychology of its subject matter.” In the prime version, all nine figures are equally visible; in the Santa Barbara version, the group of five standing mourners is relatively obscured so as to focus the viewer’s attention on the four principal figures. The light is more diffused than in the dramatically lit Lyon version and has a pinkish tinge, suggesting dawn. According to Kahng, Delacroix was unhappy with the “dryness” of the paint application in the parts of the monumental canvas that his student and assistant Louis de Planet had blocked in, and had to go back and fix the glazing of those areas. The overall finish of the Santa Barbara version causes Kahng to wonder, “Is the Santa Barbara easel-size variant Delacroix’s attempt to correct this dryness and at least satisfy his own idea of how the Lyon version ought to have looked?” She believes that whatever the answer to that question may be, the paint handling and design of the Santa Barbara version of The Last Words of Marcus Aurelius show it to be by the artist himself and to be a finished work, not a copy. 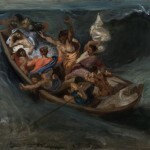 She argues that Delacroix’s students were bad painters, on whom he relied mainly for help in enlarging his compositions to grand scale, and that moreover his distinctive loose, brushy technique and mastery of color were essentially unteachable. As a result, she believes that the master’s hand is unmistakable and that it can be clearly discerned in this painting. To today’s viewers, the subject of the composition may seem uncharacteristic of Delacroix, since he is now best known for his Orientalist paintings based—with a combination of observation and imagination—on contemporary North African life. But the Classical world had a hold on him, too, and traditional history painting made up a large portion of his oeuvre. Unlike many of his Greco-Roman-themed paintings, The Last Words of Marcus Aurelius is not based on any particular Classical text or iconography. In fact, as Kahng has discovered, it derives entirely from a French book originally published in 1691, a translation of Marcus Aurelius’ Meditations by a husband-and-wife team, André and Anne Dacier. The deathbed drama, which features prominently in the introduction to that volume, was entirely the invention of the Daciers. 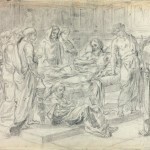 And the only visual antecedent for Delacroix’s composition is an illustration in the 1800 edition of the Daciers’ book, engraved by Moreau le Jeune.